Moon Chase! » Blog Archive » PGSM Update April 2010 – Part 3! PGSM Update April 2010 – Part 3! Dancing, Plays, Video Games, and Doramas make up this round of PGSM Actor Updates! Aya Sugimoto Dances, and Teaches! Aya Sugimoto (Queen Beryl) is not only known for her acting, modeling, “modeling”, and “writing”, but also for her great dancing ability. Last March marked the Japanese premiere of the popular movie musical Nine, starring Penelope Cruz, Nicole Kidman, Fergie, Marion Cotillard, Sophia Loren, Judi Dench, Kate Hudson, and Daniel Day Lewis (is it not sad that I know them all by heart). At the premiere, Aya did a re-creation of Fergie’s infamous “Be Italian” routine from the movie with another dancer, Steven Haynes. This drew rave reviews, not only for Aya’s immense talent, but for her “talent” as well. Fans can check out a video of her performance here! Aya also did her part to repair Toyota’s image with women. The disgraced car company launched a new car in Japan called the Passo + Hana. As part of a special marketing campaign targetting women, Aya hosted a class with newhalf idol Ai Haruna. Entitled the “Girl Power Improvement Course of the Passo+Hana Women’s University in Spring”, the two of them gave women dating advice. Aya noted that a woman on a date sitting in a car, needs to make her legs look beautiful. There was also something else discussed at this class, but this blog is rated PG-13, and we’re not going to write about it. Masaya Kikawada is a Detective! Masaya Kikawada (Motoki) is starring as a detective in the new dorama Keishichou Shissounin Sousaka (The Metropolitan Police Missing Person Investigation Section) that just started on TV Asahi this past April 16th. This show is about a strange case that the aforementioned division of the police is called in to investigate. A physicist disappears into thin air during a supernatural show, and in their search to find him they uncover a lot more than they expected. And of course, there are always relational complications between team members. Masaya plays Junichi Morita (he’s at the end on the left side) a mild, passive, and sincere detective with a strong sense of justice. He has one flaw, and that is that he has a constant tendency to say more than he needs to. He’s also got a sharp mind and is very good with technology. Masaya also appeared at the Paul & Joe Fall/Winter 2010 fashion show in Tokyo just a few weeks ago. And to top things off, Masaya also appeared at the opening of Forever 21‘s Asian Flagship Store in Ginza on April 29th. Who knew our shy Motoki liked couture? Akira Kubodera Voices Legendary Shogun Leader! 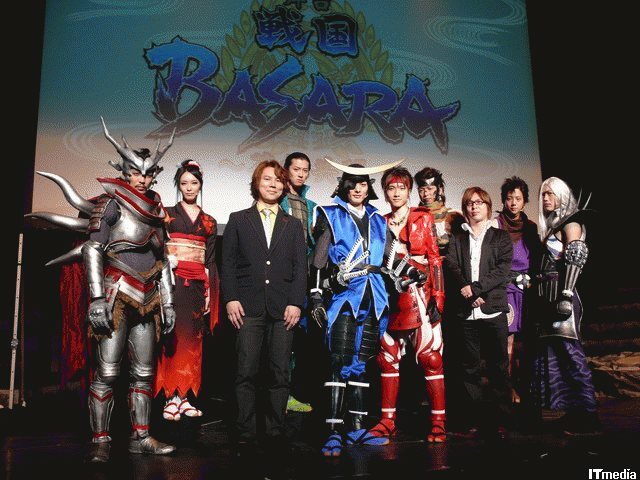 Capcom is going to release Sengoku Basara 3 this summer for the PS3 and Wii in Japan (it will be on its way here and will be called Sengoku Basara: Samurai Heroes). This is the latest in the popular game series set in feudal Japan where states are at war with each other. Akira Kubodera (Nephrite) will be playing Nobunaga Oda, but there’s a twist. He has been one of the evil characters in the two previous games, but is killed sometime between the last one and this one, and will only appear in flashback sequences. Capcom may bring his character back in a future game, and this new one features all sorts of new characters from the North and South of Japan. The game was presented on April 9th at the Ikebukuro Sunshine Theater, and many of the game’s seiyuu showed up in full cosplay. Akira dressed up as his character (first on the left). We almost couldn’t recognize him until we read the caption! What do you all think of his cosplay? Unfortunate Tale of a Betrayed Woman Features Mariko Tsutsui! Youkame no Semi (The Cicada on the 8th Day) is a 6 part dorama airing on NHK as we speak. It is the sad tale of a woman named Kiwako, who has an affair with Takahiro, a married man. He gets both of the women pregnant, and forces Kiwako to get an abortion. Kiwako learns right after her abortion that Takahiro’s wife was also pregnant and had a baby girl. She feels betrayed that she was not allowed to have a child of her own, even though Takahiro loves her more than his own wife. One night, she kidnaps the baby and spends the next 5 years on the run in Japan. The show picks up two decades later when the daughter (renamed Kaoru from her birth name of Erina) turns 20 and begins her own affair – Kiwako shares her story with her, finally. In the third episode entitled “Sad Women”, Kaoru’s first four years are shown. Kiwako has found a womens’ commune (the House of Angels) to live in, and has started a new life there with Kaoru. Everything seems calm and peaceful, until she is forced to go on the run again after her face ends up on television and Takahiro spots her. Mariko Tsutsui appears in this episode as Dr. Sakakibara. From what’s been seen of this dorama, it is pretty powerful and gripping. Kaori Moriwaka in 80’s Rock Band Battle! Kaori Moriwaka (Ikuko Tsukino) will be one of the special guests at this year’s Nexus Annexus festival at Japan’s Studio Coast. On June 6th, there is going to be an “epic” rock battle of the bands with artists that were popular in Japan in the 80s. Kaori got her start in the entertainment industry as the lead singer and songwriter for the popular girls’ rock band the Go Bang’s back in the 80s and 90s, and she will be one of the competitors in this rock battle. This should be a fun show to go see, no matter who the winner is! If you’re in Tokyo this summer and want to check it out, here’s some more information! Narushi Ikeda Tries His Hand at Directing! Narushi Ikeda may have played Minako’s agent Sugao Saito, and appeared to know everything that he was doing. But, this is not the case in his real life – he has always been an actor, never the director… until now! Playing at the Tokyo Globe Theatre right now is the play Hakurankai, presented by Parco Produce. It is about a team of artists getting prepared for a world’s exhibition in the very tropical Taiwan during World War II when there is much tension all over. 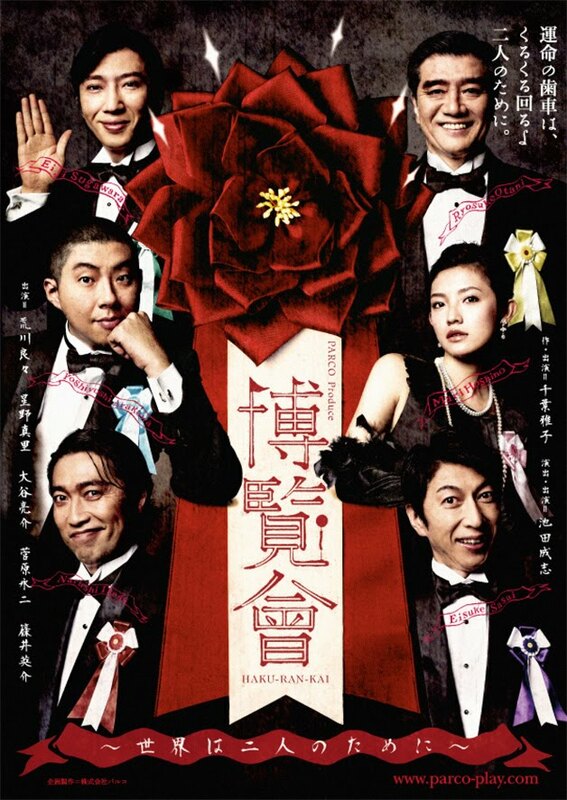 The comedy stars Narushi, and he also makes his directorial debut in the play. He said that it was tough initially, but it was something that he had aspired to do. He always got feedback from the other actors to make sure that his decisions were working with everyone! The play has been running since January and has been a resounding success! He is pictured here in the bottom left corner, and fans can check out an interview with him here. This entry © Moon Chase. Written by sailordees and posted on April 17, 2010 at 2:07 am and filed under Akira Kubodera, Appearances, Aya Sugimoto, Concerts, Japan, Kaori Moriwaka, Mariko Tsutsui, Masaya Kikawada, Narushi Ikeda, PGSM, Theatre, TV Shows, Video Games. Bookmark the permalink. Follow any comments here with the RSS feed for this post.